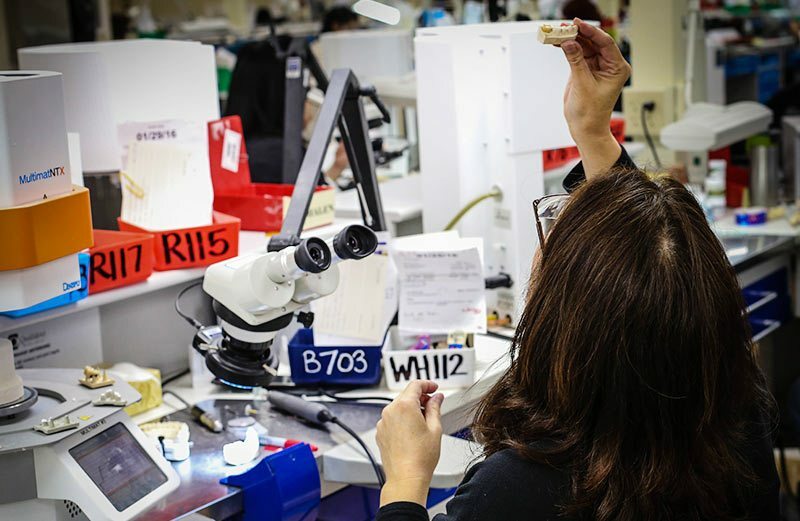 Our experienced team of restoration artists create every porcelain fused to metal restoration using exceptional craftsmanship and attention to detail. We build our restoration from a digitally designed and fabricated wax-up, and use your choice of semi-precious and precious alloys. When it comes to functionality, cast gold crowns make the ideal choice. No ceramic or alloy offers the same level of plaque resistance and biocompatibility as gold, an alloy formulated to be nearly as gentle on opposing teeth and natural tooth enamel. With no ceramics to crack, full cast crowns offer incredibly durability. From inlays and onlays to crown and bridge restoration, we offer a full range of options designed to meet every patient’s budget and needs. Full-contour zirconia crowns rank as the strongest, most durable tooth colored restoration available in dentistry today. In cases where a full-cast gold crown is unavailable due to cost or color, our full-contour zirconia restorations make an excellent alternative that every patient will love. With layered porcelain placed on top of a zirconia substructure, the strength and durability of our PFZ crown is exceeded only by our FCZ restorations. Thanks to the stunning aesthetics offered by the translucency of layered ceramic, our zirconia crowns make an excellent selection for both anterior and posterior restorations. Our Fixed Crowns Department specializes in E-max pressed crowns and veneers utilizing cut-back or stained artistic restorations. Exceptional aesthetics makes our E-max crown a great choice for anterior restorations. Our skilled and experienced Implant team has worked with nearly every implant system available. 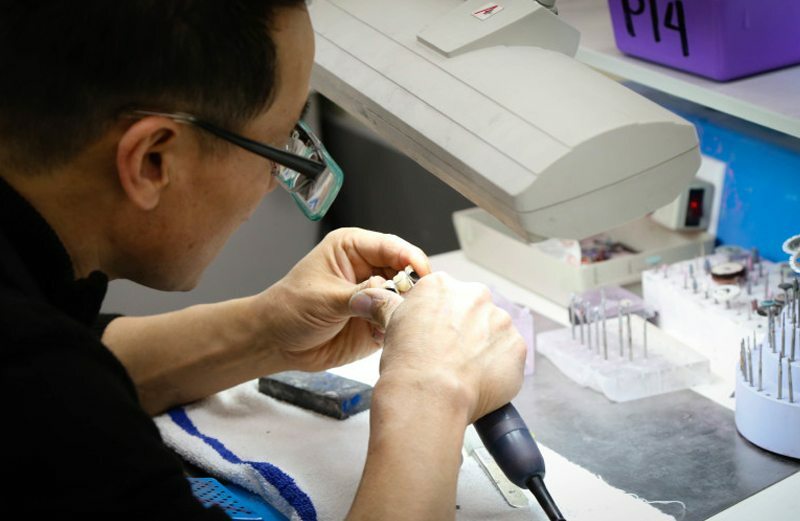 This provides our team with the ability to make a highly functional, customized crown from nearly any material required. We welcome the use of traditional custom abutments or prep stock abutments. The dental wax-up offers practitioners an excellent method to fully visualize the true restorative needs of their patients. We are happy to share our expertise and make suggestions on materials, case design, sequencing, equilibration, and estimates. With our available range of provisional crowns, you can provide patients with a beautiful, great looking smile immediately after preparing their teeth. Our team of dental technicians offer extensive experience in crafting full dentures for patients. 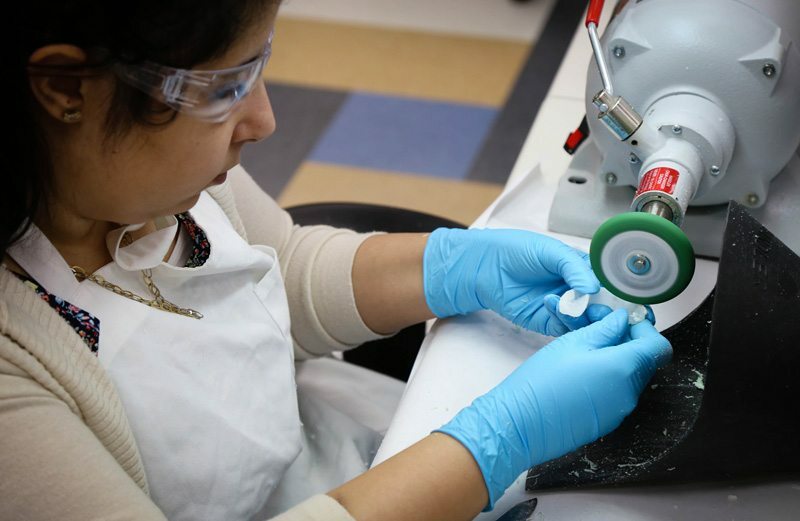 Using the highest quality materials, durable designs, and state-of-the-art equipment, our technicians create a durable restorative appliance that's comfortable to wear. Our knowledgeable technical support team can also help provide advise on even your most challenging cases. Immediate dentures require a combination of flexibility and durability to meet the temporary needs of your patients. 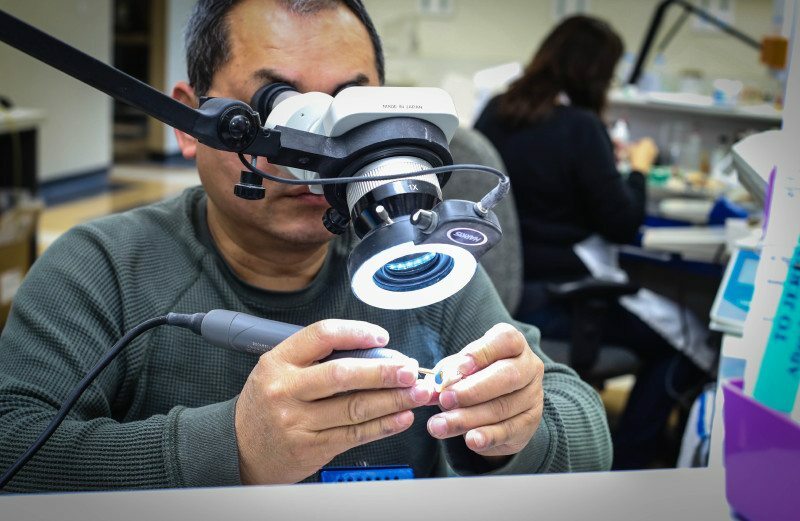 Our experienced team of dental technicians use the best designs and highest quality materials to craft a durable appliance that will have your patients smiling again. 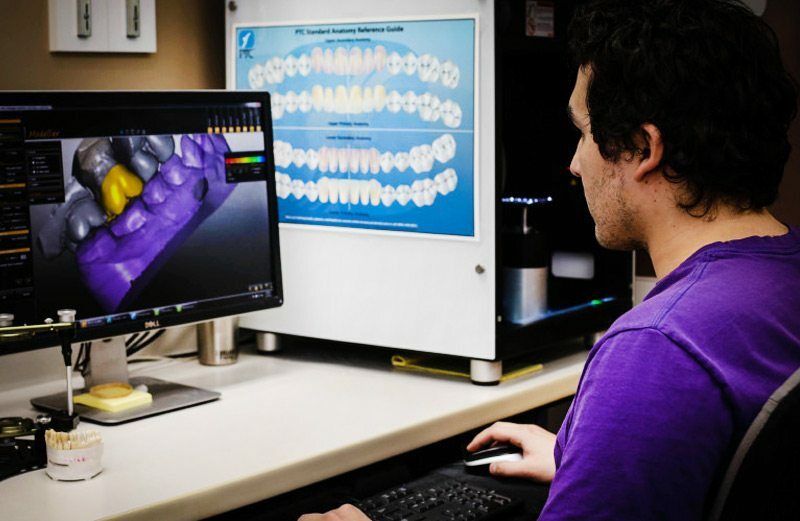 When we receive a partial denture order, our experienced team examines and designs the partial denture using the clinical information and personal preferences provided. Exacting attention to detail, combined with quality materials and techniques, results in precise fit and lasting results. Our partial dentures provide a natural appearance that flawlessly blends into the patient’s natural tissue and surrounding teeth. Flexible dentures allows restorations to adjust to the contours of the mouth while offering stain resistance, durability, and improved comfort. Complicated cases that require the use of implant dentures can be challenging and require the use of the latest technology to successfully complete. Our experienced technicians can help guide you through this process, making recommendations along the way that will keep your patients looking and feeling their best. 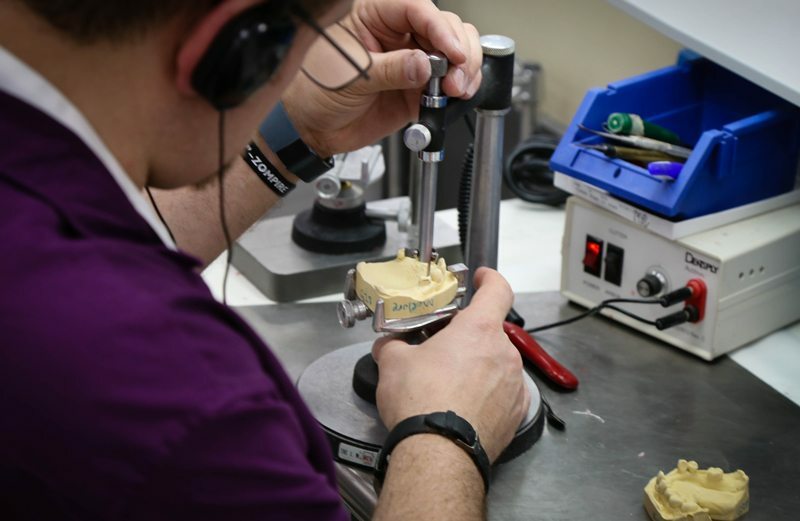 Using a modern framework, our technicians craft molds using extremely durable and pliable materials that are easy to cast into thin frames that are less likely to break when compared to similar plastic molds. Used to help protect teeth from clenching and grinding, we offer a full line of night guards from digitally milled Hard acrylic to Soft thermal plastic. These custom made products offer the fit and comfort your patient desires. Years of use can leave even the most highly crafted restorations in need of a little repair and realignment. Our team of experienced technicians can restore the form and function back to any of our restorations so your patients can get back to looking and feeling their best. Inter-oral scanning is now the present reality. Offering your patient a comfortable and convenient digital scan for their prosthetic restoration, separates your practice from the rest. Contact our office for availability and set-up of your system.